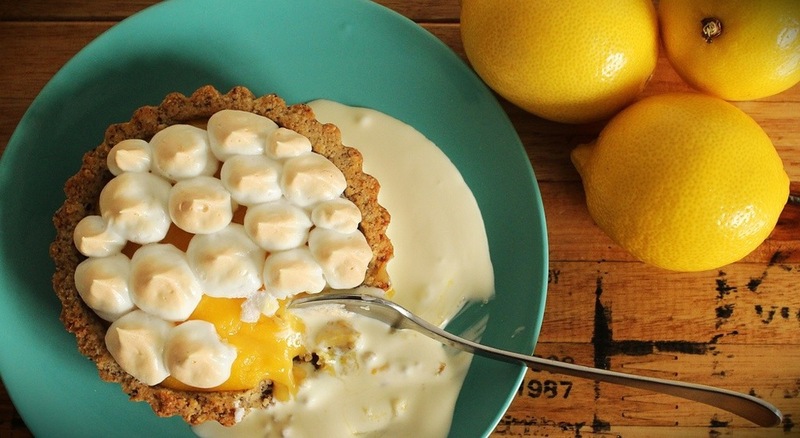 LCHF Lemon Meringue Pies! There's a few steps involved in these little babies but well worth the effort. I've broken it down into the components. Pie Crust Shells: Preheat oven to 180°C Melt 100gms Grassfed Butter, set aside to cool a little. Mix together 1 Cup Hazelnut Meal, 1/2 Cup Almond Meal, 1Tablespoon Coconut Flour & 2 Tablespoons Xylitol. Whisk 1 egg with cooled melted butter then stir through dry ingredients until well combined. Divide into 4 and press into 4 greased 12cm flan tins. Bake in oven for 10-15minutes. Lemon Curd: Place 125gm butter and zest of 2 lemons into a saucepan on low heat until butter is melted. Combine juice of 2 lemons and 1/2 Cup of Xylitol and stir to dissolve. Add this to the melted butter and whisk well. Off the heat pour the lemon butter mix a little at a time into a bowl with 6 egg yolks. Whisk continuously as you add all the liquid. Return everything to the saucepan over low heat and whisk until curd thickens. Strain curd to remove any lumps and zest then spoon into pie crust shells. Meringue: Beat 2 egg whites on medium speed until soft peaks start to form. Add in a splash of vanilla extract and 2 Tablespoons of Xylitol (added gradually) and continue beating until smooth and glossy. Finally add 1/4 Teaspoon Cream of Tartar and combine. Pipe meringue on to lemon curd and bake pies at 180° until meringue is golden. Enjoy with a generous serve of cream.